Some states have recently addressed the integration of their non-citizen populations and their socioeconomic needs by expanding the eligibility of professional licensing to non-citizens. Changes made in 2016 in the two states with the largest immigrant populations, California and New York, were extensive and comprehensive. California removed immigration status requirements for licensing through legislation that covered all occupations regulated by the California Department of Consumer Affairs. 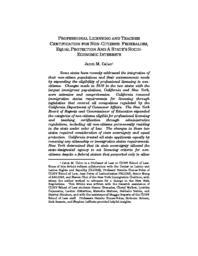 The New York Board of Regents and Commissioner of Education expanded the categories of non-citizens eligible for professional licensing and teaching certification through administrative regulations, including all non-citizens permanently residing in the state under color of law. The changes in these two states required consideration of state sovereignty and equal protection. California treated all state applicants equally by removing any citizenship or immigration status requirements. New York determined that its state sovereignty allowed the state-designated agency to set licensing criteria for non-citizens despite a federal statute that purported only to allow such licensing through state legislation. Both states concluded that an expansion of the eligibility of non-citizens for licensed professions allowed them to maximize the benefits of their in-state tuition policies and provided economic and social advantages for their communities.